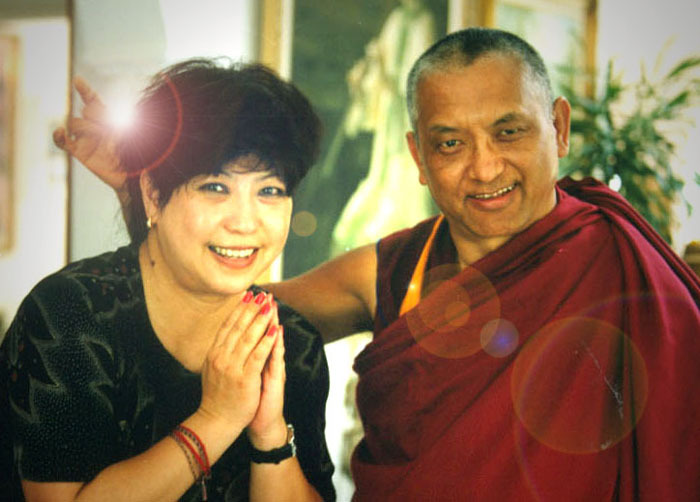 "I was fortunate enough to travel with Rinpoche on His teaching tour in Spain this summer. Highlight memories which I thought others would enjoy include…..
Rinpoche's generosity with His time - for example, Rinpoche always wanted to give an extra talk before leaving each center - this happened in Rinpoche's room in Madrid (with Rinpoche cutting up fruit for everyone); cramming into the library in Oseling with Rinpoche giving the Milarepa mantra to us (which somehow didn't get given during the initiation!). Rinpoche sitting below a large palm tree in Juan and Paloma Bas' garden in Onteniente in order to give a lung to the students of Tekchen Choling Study Group. This then meant that we would leave late in the day to travel to the next center, with Kiko (Tushita Retreat Centre director) driving us through the night. Rinpoche with great care making delicious warm fruit pudding for the lunch with staff and volunteers in Oseling. 8 Nalanda monks sleeping in the corridor of Nagarjuna Barcelona during a gap in making wealth vases with Rinpoche. Rinpoche naming one of Bea (dynamo of Tushita Retreat Centre and cook on the tour)'s dishes for an eventual cookbook - enchiladas became Compassion and Wisdom! Rinpoche at 3 am in Barcelona finding time to give specific advice for the Spanish center directors' meeting. Rinpoche giving the lung of the Golden Light Sutra in Barcelona - only to come back after the break to find Rinpoche in peals of laughter as He had given a different lung..and then the amazingly wonderful teachings on emptiness (which we hope will form part of a book of Rinpoche's teachings and guided meditations on emptiness). Taking the advice below from Rinpoche..."
While in Spain recently, Rinpoche gave some advice for the Spanish National Meeting - and the advice is relevant for all centers. 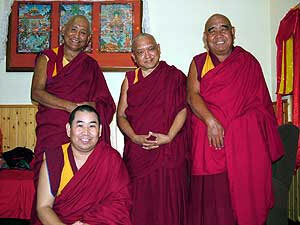 Rinpoche in Spain with FPMT resident geshes - seated Geshe Jamphel (Barcelona and Nalanda), from left to right Geshe Tenzin Dorje (IVY) and Geshe Lamsang (Valencia). Pay attention to looking after the geshes, thinking about their needs. Really taking care. Really respect the resident teacher - even though he may not be a high lama, because he stays at the center he is even kinder [than a visiting lama]. 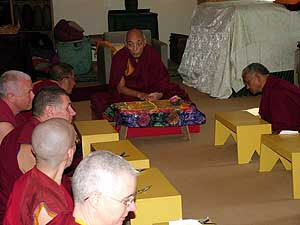 Also the geshe is a gelong, so if you respect him, you collect merit. Also this is keeping your refuge vow [to respect Sangha]. Pay attention to how to look after people visiting the center. This is for the success of the center, which means to spread the Dharma for more people, to help more people to reach enlightenment. To achieve that means you need to check how people respond to you - this depends on whether you take care of them, look after them. We have spent a lot of time on this topic at past meetings, so go through the minutes of past CPMT meetings to learn from them how to take care of people: respect those who come to the center, be polite, physically respect them, all those things. Take the advice from those meetings seriously, for example the things we discussed at the CPMT in Holland. We really need to pay attention when people come to the center. Like a bodhisattva talk very nicely to people to draw them into the Dharma so you can liberate them from suffering, bring them to enlightenment. Taking care of people, all of this, doesn't have to be a political thing, you should think of this as your bodhisattva's conduct to draw people to liberation, enlightenment. Remember this every day - otherwise when you get very busy and stressed, you will forget. If you remember this, stress goes away. If you can keep an updated list of materials available, then no-one will miss out on doing practices because they don't know that the practice is translated and available. Be careful, watch your behaviour to other people, be kind. Offering food to center students is a way of collecting unbelievable merit because students are the pores of the Guru. Disciples of the same Guru collect more merit from offering food to fellow disciples than from offering to Buddha, Dharma, Sangha, numberless statues, stupas. People don't think of this, think only of offering food in monasteries. But you can collect merit this way too. If you offer with the thought that they are the Guru's pores, as they have the same Guru, if you offer with this recognition whenever you meet someone with the same Guru then even if you offer chocolate, water, or money, anything that you have if you offer with this recognition then that is an unbelievable way to collect merit, by thinking that as they have the same Guru so they are the Guru's pores. So then if you offer to many Sanghas who have the same Guru then you are making offerings to that many pores of the Guru. So this is the easiest way to collect skies of merit by offering. By offering even just one candy, flowers or even one grain of rice to a statue of Buddha or even a visualized Buddha you collect skies of merit but here it is much more powerful than offering to the 3 jewels (Buddha, Dharma, Sangha) as well as all the statues, stupas and scriptures existing in all directions, so no question if offering to really the same Guru's disciple, whether lay or Sangha - it doesn't have to be only Sangha. These benefits should be understood so that when you make offerings to the Guru's pores you think correctly. This is the best business. Sometimes centers don't have much money, but if the director knows Dharma, they can very skillfully create merit [without needing much money]. When you meet people, support people, you also collect merit, which means that you can achieve enlightenment, support one's own and other's happiness. If organizers at centers are not skilful and wise, knowing how to take care of people, then even having a geshe teaching Dharma may not be enough. Developing the center doesn't only depend on the teacher, but on how you look after people. People can be made to feel welcome so they are attracted to come to the center, or not. So we must pay attention to this. The essential thing is to make people happy, serve them well. This helps to build up the center, to get material support very easily even without pushing. The purpose of course is to have more facilities because then the center has more ability to spread the Dharma, more comfort, facilities, so more people can enjoy, receive the Dharma, so you can benefit them more, liberate them from oceans of samsaric suffering and bring them to enlightenment. You need to be aware of so many things. However the key thing is to know how to take care of people. Must cherish every person who comes to the center, feel they are so precious, take care of them. Respect naturally comes from that, then caring, then the person is so delighted. There are so many opportunities to collect merit for the center if you know Dharma. Even just offering a bowl of water or cup of tea to a person who is a student or disciple of the same guru collects so much merit. This is one way to build up the center. Think big. This is a bodhisattva's skilful means to benefit sentient beings. We have so many words at FPMT meetings, we need to put them into practice at the center. People come to the Dharma center for purification, to achieve liberation and enlightenment, so such an easy way to help them is to have a sutra playing where they can hear it as they are resting or working. You can play the Sanghata Sutra, or other sutras. Hearing the sutras can purify not only the ten non-virtuous actions, but also the five extremely heinous non-virtues and prevent rebirth in the lower realms. It is very good to have a sutra recited by a holy being (such as the recording of Kirti Tsenshab Rinpoche's reciting the Sanghata Sutra) so that there is more effect from the blessing of their speech. Or can have the sutra recited by someone whose voice is enchanting, and who flies like to listen to...! 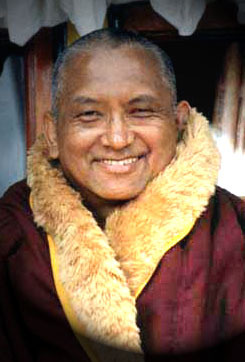 Colophon: Lama Zopa Rinpoche gave this brief advice to Karen Itzel during the retreat at Oseling, Spain; August 25th 2005. Notes taken by Claire Isitt and Karen Itzel. For all centers that offer kids' programs, and for parents, Rinpoche would like you to really promote and use these tools with the associated practice, have the children make them up and encourage them to use them, and especially encourage them after catching the bugs to circumambulate holy objects with them. Use these Animal Liberation Tools, one on each hand to catch small insects in so they can be removed from your house without injury. Designed by Lama Zopa Rinpoche these bug catchers are not your ordinary bug catching jar! Covered with mantras that benefit the bugs and quotes which benefit the humans, these unique tools of the Buddhist trade will not to be found in any store!! Tools are provided on flat card stock and required simple assembly. www.fpmt.org/shop/product1.aspx is where they are on the FPMT website! A young nine-year-old Dharma student from New York wrote to Lama Zopa Rinpoche recently to tell him: "I have been vegetarian all my life. I read your article that said you should catch bugs and let them go outside. So, when I was at Milarepa kids' camp in Vermont, I caught about fifty flies indoors, one at a time, using small paper cups. It took me all afternoon. Then we brought them to Geshe Tsulga, who blessed them, and then we took them down to the stupa, circled it while praying, and let them go. I thank you a lot for starting Milarepa." (Signed) Rafaello. Rinpoche replied: "My very dear Rafaello, I was very happy to receive your email telling me that you had saved so many flies and spent your afternoon liberating them. I want to thank you very much for practicing my advice, liberating these living beings. "Here is some more explanation about the benefits of helping living beings like this. Please see if you can understand this advice and also help other boys and girls to understand how important it is to help others, especially to help the animals and all the different creatures in the world to protect their lives. 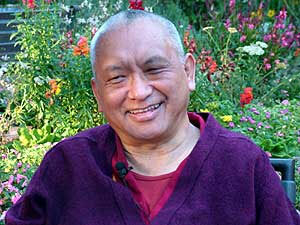 "With much love and prayers," (Signed) Lama Zopa Rinpoche. 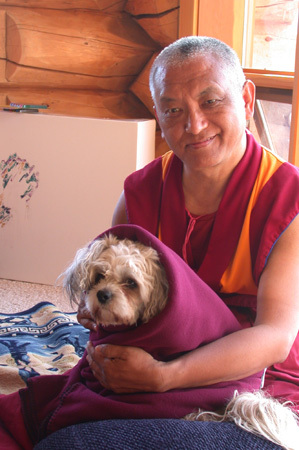 To read the advice given by Rinpoche to Rafaello for helping animals in everyday life and when they die, go to www.fpmt.org/teachers/zopa/advice/Default.asp A sample excerpt: "I started the tradition of how to liberate animals. The way we do animal liberation causes long life, but that alone doesn't ultimately help the animals, so the best thing to do is to circumambulate the animals around holy objects and to bless them with mantras and prayers. So you can carry the animals around a table in the middle of a room with many, many, many holy objects on it piled up, many tsa-tsas, pictures of buddhas, texts, whatever you have, and then you take the animals around these holy objects. "If you love your animal very much then this is what you must do for them for their good rebirth and quick liberation from samsara." The text is very precious and there is so much benefit in printing or writing it. 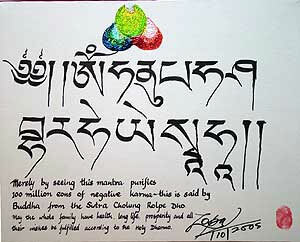 I have one copy that was given to me in Mongolia, written with pearl, coral and other jewels. 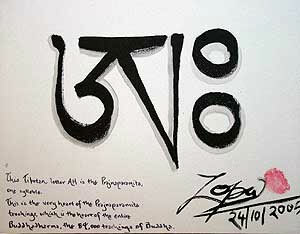 This is one of the texts that, if written in gold, mountains of negative karma get purified. Nalanda Monastery prints a certain number each week for the success of the projects, so imagine the benefits: each time they make one copy it is like copying all the 84,000 teachings of Buddha. It is also great purification. Especially, writing this collects most merit. You write it, not because someone needs the book, but just because it helps for long life and to collect merit. It's very good to print for people who have cancer, and for the success of activities and projects. If a business has difficulties, or is difficult to start, if you have difficulty finding a job, or the job is not going well, you can print many copies. You can print many copies, weekly or monthly, to make merit, not particularly for mundane success but generally to collect merit for realizations, conditions for Dharma practice. Then you can dedicate the merits of printing for all sentient beings. This is one solution for success and long life. Also, when you die you will get born in Amitabha's pure land. Anyone who talks to a person who has recited this mantra, their five uninterrupted negative karmas are purified. Just hearing the voice of a person who has recited this mantra, being touched by their shadow, or touching that person's body purifies negative karmas collected in past lives. If you recite this mantra, you won't be harmed by spirit possession, poisons, or by the elements [fire, water, air and earth]. All the Buddhas will protect you and guide you and all the devas and those who are living in samaya4 will support you. If you recite this mantra every day and then spend much of life talking on the telephone or working in an office - if you do consultations or have a lot of meetings - then all the people who hear your voice, their five uninterrupted negative karmas will be purified. So there is no question that the ten non-virtuous actions-everyday negative karmas like gossiping and many things, covetousness and so forth-are purified. This gives such an unbelievably great way, such an easy way to purify and to benefit sentient beings, to liberate sentient beings from the lower realms and bring them to liberation and enlightenment. PS: Zung is commonly understood to mean "mantra." Rinpoche has further explained zung as "the unforgettable remembrance special wisdom, functioning to stop non-virtue and create virtue." Lunch was offered by Rinpoche to the 31 Sangha present after Sojong at Land of Medicine Buddha, during Choden Rinpoche's recent teachings. 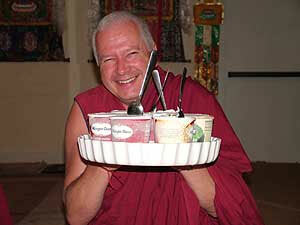 Ven Steve Carlier (who interpreted for Choden Rinpoche) with ice cream!